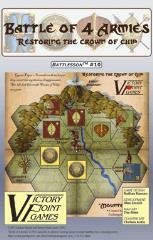 From designer Nathan Hansen comes a quick paced, deep decision rich, abstract strategy Battlesson game, Battle of 4 Armies. Match your skills against up to three opponents, for your goal is the Crown of Chip! Through the judicious used of unit placement and maneuver, you struggle to capture opposing units to knock them out of play, or hold the majority named spaces on the board. With pressure for the center of the map and maneuver around its edges, players have myriad ways to approach every turn of this absorbing game. Will you withstand the pressure and beat the odds? Make your move in the Battle of 4 Armies!